Tata is one of the indigenous car manufacturers across the world. From the first home-grown car in the form of the Indica to the ultra-low cost car in the world- the Nano, they have come a long way. A few days back, Tata launched its much awaited cross-over the Tata Aria. Now Tata is looking out to be environmentally conscious. That the manufacturer already has an electric car in the form of the first generation Indica in faraway Norway is testimony of the fact how Tata wants to percolate its know how all across the world. Tata winning and subsequently annexing the Jaguar-Land Rover deal was an icing on the cake which helped them get access to world-class technology. The Maini and now Mahindra Reva was always an electric only car with a limited range of about 50 Km. Any chances of increasing the range were met by stiff resistance in the form of no government concessions for reducing the price of the car and battery ineffectiveness. Tata thought of a novel way for this. The new Tata Indica Vista Electric car is an all electric car like the Nissan leaf. It uses a special Prem Magnet Motor which was made in Norway by TM4 and gives 55kw of power and the peak torque of 160 Nm. It is made up of super polymer lithium ion batteries and not of the lead acid types that the Reva uses. In addition to their been light in weight, the batteries have a greater storage capacity and life. They are maintenance free and highly capable. Been an all electric car means zero emissions and also less of expenditure on petrol or diesel. Regenerative braking takes care of maintaining the battery level. Been an all electric car means zero emissions and also less of expenditure on petrol or diesel. Regenerative braking takes care of the battery charging however before embarking on a journey, you have to ensure that you charge the car for about 8 hours by a plug-in. When you start the car, you would be shocked by the absence of NVH and even when the car is in motion, you would barely notice it. The car’s instrument panel is a vast change from the normal Indica Vista. The dials have been moved from the center position to the line of the driver now. Instead of a fuel gauge, you get a battery reserve pod. The interiors of the car are now two tone and externally there is not much except the electric badge and body colored alloys to distinguish it from the normal Indica Vista. The range mentioned for this car is an unrealistic 200 Kms on a single charge. 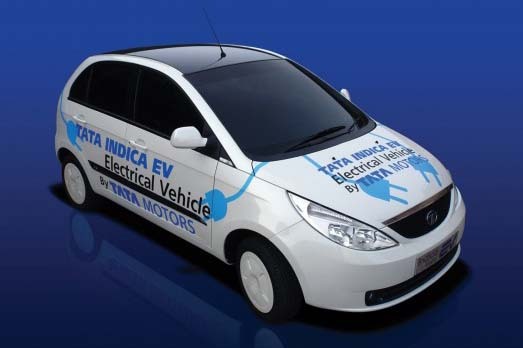 Tata Indica Vista Electric price might range from Rs 5-7 lakhs and launch it around May 2011. This would be a viable transportation option without having to worry about polluting the environment.